Ardbeg Day which became a global event in 2012 is now one of the most anticipated whisky events of the year, held as part of Feis Ile; the Islay Festival of Malt and Music that has attracted significant fanfares globally. Ardbeggians around the world have joined the Ardbeg Committee in huge numbers (currently estimated to be 100,000+) to not only access early exclusive Committee Releases of the annual Ardbeg Day special bottlings, but also to take part in Ardbeg Day (or shall we say Ardbeg Night) gatherings and celebrations around the world. 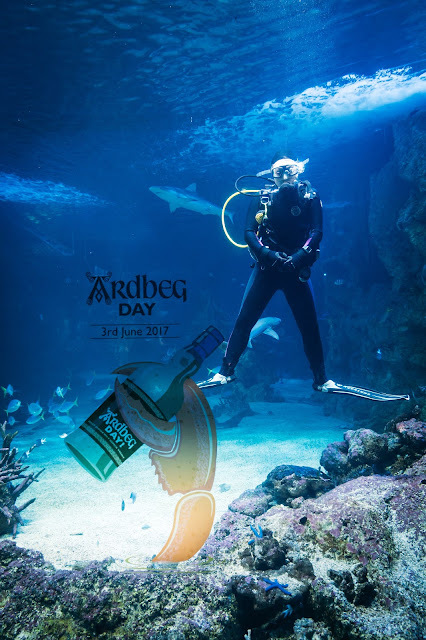 As is tradition, with Ardbeg Day also comes the annual Ardbeg Day release and it was back in August 2015 when we were the first blog globally to break the news that Ardbeg were playing around with Russian Oak, and suggested that this would likely be a future Ardbeg Day release. 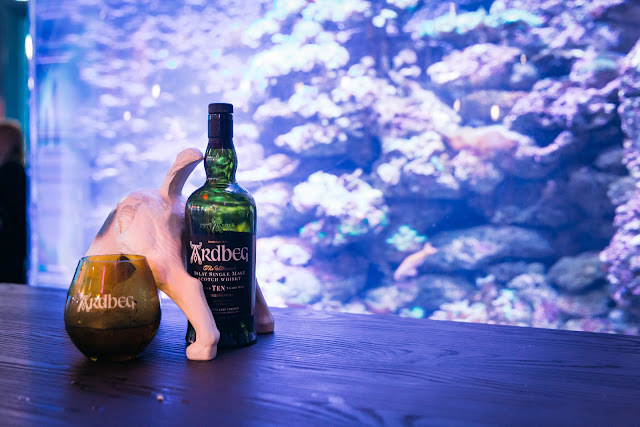 Fast forward to 2017 and the Ardbeg Kelpie was unveiled. A limited-edition bottling that saw Ardbeg's malt matured in virgin oak casks sourced from the Adyghe Republic, on the coast of the Black Sea region and married with traditional ex-bourbon Ardbeg malt. In our view, Kelpie was a particularly exciting and unique release. Black Sea oak is renowned for imparting deep flavour notes and only a handful of whiskies have ever been matured in these casks - hence the excitement. Sweet, powerful, herbal and maritime notes describe the Kelpie. See below for our tasting notes on both the Kelpie Committee Release and Kelpie Retail Release. So...what's a Kelpie anyway (other than this whisky)? The story goes that kelpie is the name of a mysterious beast that have been said to live beneath the waves. Being a Scottish shape-shifting water spirit, the Kelpie was rumoured to take the form of a horse or a bull and prey on unwitting travellers. In fact, legend has it that long ago, a farmer walking near Ardbeg's shoreline was almost dragged out to sea by a water bull. Managing to overcome and rope the creature, he locked it in a barn where it cried for mercy. At dusk, the farmer's daughter was chased by a water horse seeking revenge for its kin. The terrified girl ran to the barn and released the water bull, whereupon the malevolent beasts took flight back to the sea. Interesting folklore to complement an interesting release. In Sydney, the Ardbeg Day celebrations were equally interesting, with the main celebration taking place at Sydney Aquarium and others throughout Ardbeg embassies across town. Ardbeggians were able to score tickets in the weeks leading up to the day through the purchase of Ardbeg cocktails across a selected number of bars around Sydney CBD. 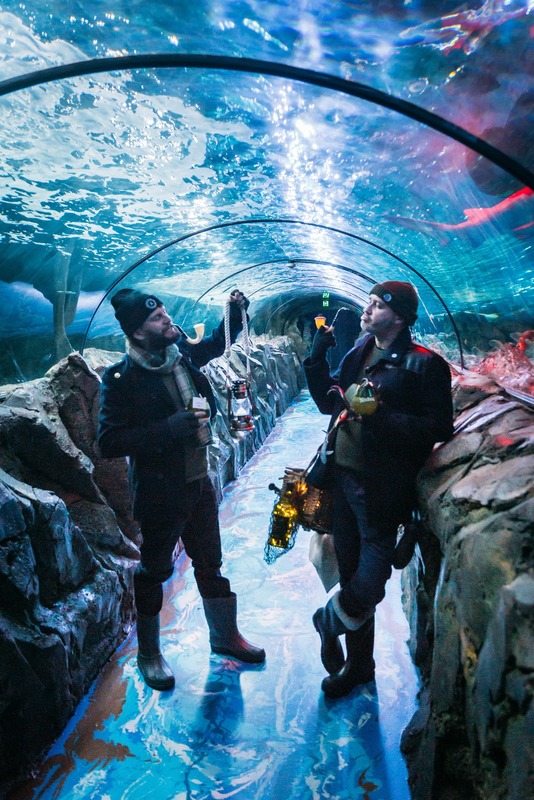 We joined the celebration at Sydney Aquarium where the Kelpie theme was well and truly alive with guests being presented cocktails amongst all the slithering sea creatures that swam around them. 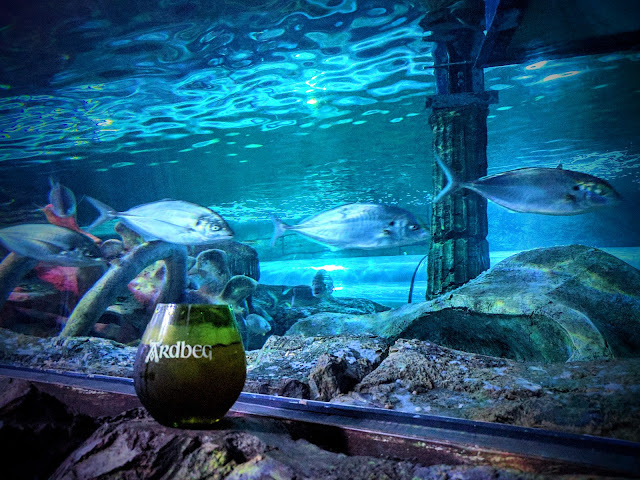 It was undoubtedly a unique and once in a lifetime experience to be able to walk the shark tanks at night with an Ardbeg cocktail in hand surrounded by dugong, sharks and all kind of sea creatures swimming about. Kudos to the creativity, ingenuity and passion of the Moet Hennessy team for putting this together for this year's Ardbeg Day. 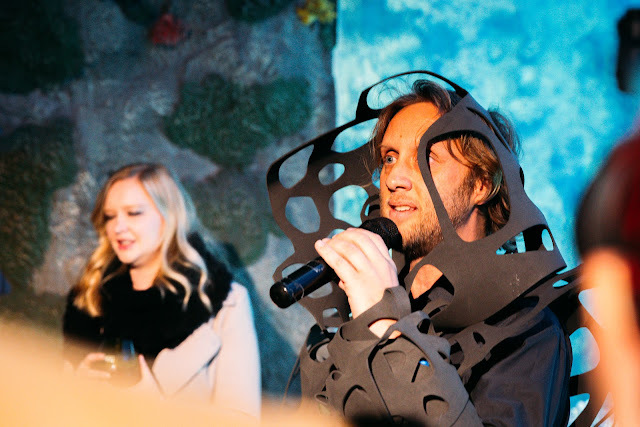 Guests joined in, with props that breathed life into the Kelpie and maritime theme. Everything from dressing up as seaweed to strewing sea lanterns and fishnets around. Even Shortie joined in hanging out by the tanks with his favourite companion - Ardbeg Ten. 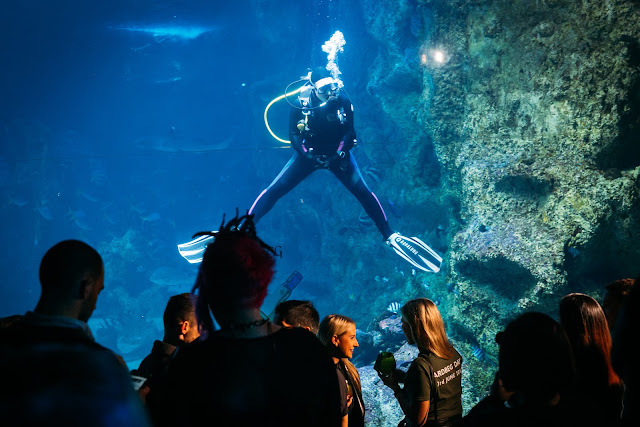 The main event was held at the Great Barrier Reef room with a couple of divers entertaining the guests and crashing a few selfies throughout the night. 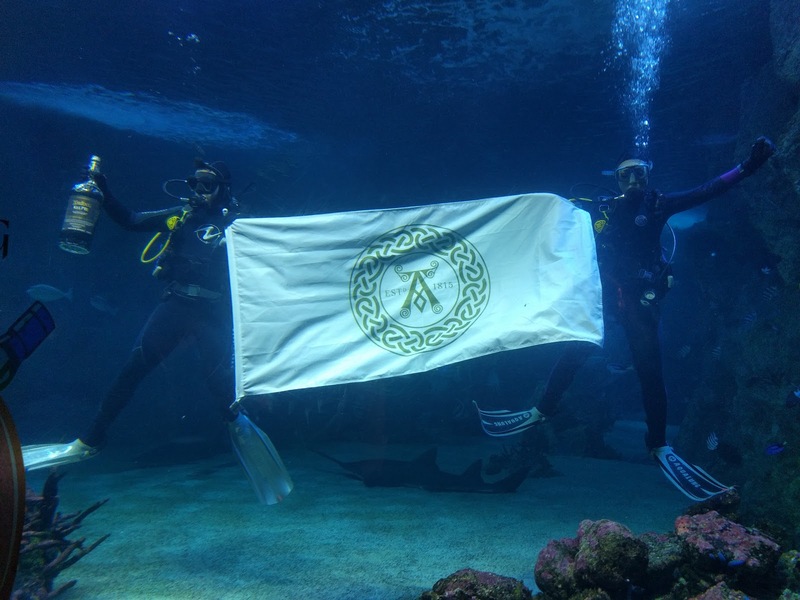 The unveiling of the Kelpie involved divers stretching out the Ardbeg flag and showcasing the 4.5L Kelpie to the guests before Garth Foster of Moet Hennessy welcomed the guests and spoke about the release. Nothing like celebrating and sharing a dram with your mates and also a couple of hundred maritime creatures! Having tasted the Committee Release few months ago, it was interesting to compare it to the Retail release on Ardbeg Day....thoughts below. Nose: Sea breeze with whiff of cured seafood. The nose is pungent - though nice and salty, maritime. There's also an interesting mixture of milk chocolate, smoked / grilled fish, mediterranean spice. I love the nose of this particular release. Palate: A mixture of chilli spice, beach bonfire, more of the smoked fish and maritime notes come through followed by some sweetness; milk chocolate, perhaps chilli chocolate. Lots of spices; pepper and nutmeg follows. Nose: Just like the Committee Release, the smoke is there and there's almost a layer of umami; nori / seaweed with also hints of chocolate. Less smoked fish and maritime than its Committee Release counterpart and bringing it closer to your typical Ardbeg Ten. Palate: The lower ABV has calmed this expression though there's still plenty of bonfire ash smoke, salted pork. The palate is also oily, maritime, sweet and citrusy and filled with spices. Not as varied as the Committee Release though more balanced and again draws you closer to that typical Ardbeg Ten. Of the two releases, I personally enjoyed the committee release more where the nose and the palate were both more eccentric and perhaps played to what the black sea casks offer. The retail release is definitely well balanced and brings out more of the typical Ardbeg smoke and characteristics. Nevertheless, I would still have both as my everyday dram - especially in these cold and dark Sydney winter nights. Both releases are interesting in their own right and the use of the black oak casks introduced some maritime and briny characters which were both exciting and surprising.